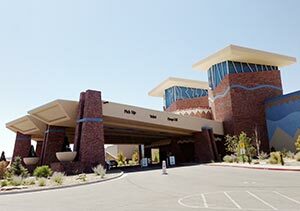 TOP: Upper Fruitland is home to Northern Edge Navajo Casino, but doesn’t get any special revenue from it. Corn awaits harvest in one of the many individually owned farms along the San Juan River. Upper Fruitland Chapter is also home to Navajo Agricultural Products Industry, which takes up more than half the chapter’s land. Since Audie Greybear came to Upper Fruitland as chapter manager in June, he's had a steady procession of locals in and out his door. "They want to tell me about the community's history, they want to tell me about problems they're having -- and," he said, "they want to talk about Bigfoot." Meet with a couple of Upper Fruitlanders and, within five minutes or so, the conversation turns to Bigfoot. Everybody seems to have had an encounter -- either a glimpse out of the corner of their eye, missing crops or animals, or hearing an eerie, unidentifiable howl in the middle of the night. Greybear is already getting a little tired of the hairy hominid who, whether or not he's real, manages to steal time from the chapter. "The other day we were having a meeting about improvements at the rodeo grounds and a lady started talking about how a Bigfoot ran through her yard," he said. "We're doing this major renovation on the Walter Collins (multipurpose) building, and all people want to know is, 'Will it be done in time for the Bigfoot conference?'" Of course, Greybear has only been in the chapter a few months. If the locals are right, it's only a matter of time before he has his own encounter. "If I do meet Bigfoot," he asserted, "I'll treat him like any other chapter member. I'll ask him if he needs housing assistance. I'll encourage him to apply for our scholarship fund." If Sasquatch asks for a home-site lease, however, he's out of luck. About six years ago, the chapter asked the Natural Resources Committee of the Navajo Nation Council to put a freeze on home-site leases in the chapter because, explained Council Delegate LoRenzo Bates (T'iistoh Sikaad, Nenahnezad, Upper Fruitland, Tse' Daa' Kaan, Newcomb, San Juan), the chapter residents felt too many outsiders were applying for the leases, leaving their children out in the cold. Name: The neighboring, off-reservation town of Fruitland got its name from the orchards planted by Mormon pioneers. At one time, Upper Fruitland, on the higher banks of the San Juan, had many fruit trees as well. But the Navajos for centuries called this place "Doo' Alk'aii" ("Not Fat" ). 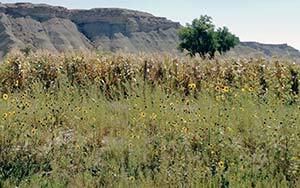 Upper Fruitland native John Blueyes said the story that has come down has to do with a trap the Diné set for pronghorn in a box canyon near here. So many antelope were captured that the hunters could pick and choose. "They would say, 'That one's not fat,' and toss it aside," Blueyes explained. Major clans: Because this has always been a desirable place to live, many clans are represented here. There is also some Jemez Pueblo blood dating from the Pueblo Revolt, when the Jemez tribe sent some of their women and children to hide among the Diné. Famous sons: Walter Collins, a founder of the modern community of Upper Fruitland and an advocate of better education for the Diné. The Walter Collins Multi-Purpose Building bears his name. Issues: More than 50 percent of the chapter's land is taken up by the Navajo Agricultural Products Industry, leaving little good grazing land. Competition for home-site leases led to a moratorium on them about six years ago. In truth, Upper Fruitland is one of the most desirable places to live on the Navajo Nation -- riverfront property and a short commute from Farmington, the largest city in the Four Corners. Greybear thinks it's time to rethink the moratorium, or at least allocate some land for a subdivision. "If you look just outside the reservation boundary, you can see someone's building a development," he said. "I'll bet 100 percent of those houses will be occupied by Navajos. Why shouldn't the chapter be getting some of that action?" One reason developable land is in short supply in this chapter is because the Navajo Agricultural Products Industry takes up more than half the chapter's acreage. It's a double-edged sword, said John Blueyes, the former director of the Navajo Nation's Agriculture Department. Now retired, Blueyes, an Upper Fruitland native, volunteers his expertise at both his home chapter and next-door Tsé Daa K'aan. "NAPI does supply a lot of jobs," he said, "but it has a lot of adverse impacts too." Blueyes worries about pesticides in the air and running off into the river, and feels that large companies like Frito-Lay, which lease fields from NAPI, have too much control over the tribal enterprise. "They're growing GMO (genetically modified) crops over there too," he said. There are also about 100 small, individually owned farms along the riverbank that have local markets and aren't threatened by competition from NAPI. But most of them have become little more than hobby farms as small-scale agriculture becomes more expensive and less lucrative. "You see the nice equipment this guy's got?" Blueyes pointed out on a tour of the riverbank farms. "He's got a job at the power plant. There's no way he could afford that just by farming." On the tour, we encountered a young man casing the riverbank with a BB gun. As an experiment, Blueyes asked him if he had ever seen Bigfoot roaming near the river. He hadn't, but he had heard him. "One night, about 2:30 in the morning, I was parked somewhere near here in my car and I heard this weird howl," the man volunteered. "It sounded human, but really, really loud. You could hear it echo off the banks." "See?" Blueyes asked as we pulled away. "Everybody here has a Bigfoot story." Blueyes himself once saw an extremely tall, shadowy figure walking right down a street in his NHA subdivision at dusk as Blueyes was watering his lawn. "I thought it was a drunk at first," he said. "But it cocked its head in this really weird, not-quite-human way." Upper Fruitland, to tell the truth, does not even need Bigfoot. Over the years, it has had plenty of larger-than-life human characters. Moncisco Mesa, south and east of the chapter compound, is named after one of them. Old Man Moncisco, who died in the late 1940s or early 1950s, was almost literally larger than life. "He was about six-three, 350 pounds," said Blueyes. "He had a lot of horses and a lot of wives. His real name was Francisco, but a lot of Navajos at that time couldn't pronounce the 'Fr,' so they just called him 'Moncisco.'" According to Blueyes, Moncisco used to like to drive his wagon into Farmington. "He'd drive down the road at about 90 miles an hour," Blueyes said. "He had teams stashed all along the way, so as soon as his horses got tired, he'd trade them for another team." On his way back home, said Blueyes, Moncisco was so drunk he couldn't hold himself upright in his wagon. "One of his wives would wrap a blanket around him, and hold him up by the blanket," he said. If he were around today, Old Man Moncisco wouldn't have to drive all the way to Farmington. The Cedar Bow Bar at the two-year-old Northern Edge Casino serves nice cocktails. But neither NAPI nor the casino are great economic boons to the chapter, according to the chapter's projects director, Alvis Kee. "Because of federal law, the casino can only donate money to very specific things," Kee explained. NAPI will donate feed for rodeos and things, but that's about it, added Greybear. "We pay the same price for hay as everyone else," he complained. "Considering they took up half our chapter, we've never been compensated." When the chapter needs funds for a project, he said, it has better luck going to nearby private companies -- BHP Billiton, which owned the Navajo Mine until it sold it to the tribe last year, and the co-owners of the Four Corners Power Plant, Public Service Company of New Mexico and Arizona Public Service. "With the private companies, you just write them a letter and they tell you yes or no," explained Greybear. "There aren't a lot of hoops to jump through like there are with the tribe." As sick as Greybear is of Sasquatch, he's even more weary of Window Rock. He seriously thinks Upper Fruitland should explore ways to secede from the Navajo Nation. "We have everything we need to be our own entity," he pointed out. The chapter was certified under the Local Governance Act two years ago, and paid an Albuquerque law firm big bucks to draft it a tax ordinance, but the ordinance has been sitting in the Office of the Navajo Tax Commission -- not because the commission doesn't like it but because it likes it too much. "They want us to give it to them to use as a template for other chapters," Greybear explained. "But we paid a lot of money for our ordinance. We're not going to just share it with no compensation. Besides, just because it works for us doesn't mean it'll work for Church Rock or Nageezi. Every chapter is different." So there Upper Fruitland sits, "like a teenager with one foot out the door," as Greybear puts it. Maybe they need to put Bigfoot through law school.